Since some of you have been asking what’s going on behind the scenes at Gabfire labs, here’s a quick sneak peek. Currently, we’re working on a new theme to add to the lineup named Capacity. 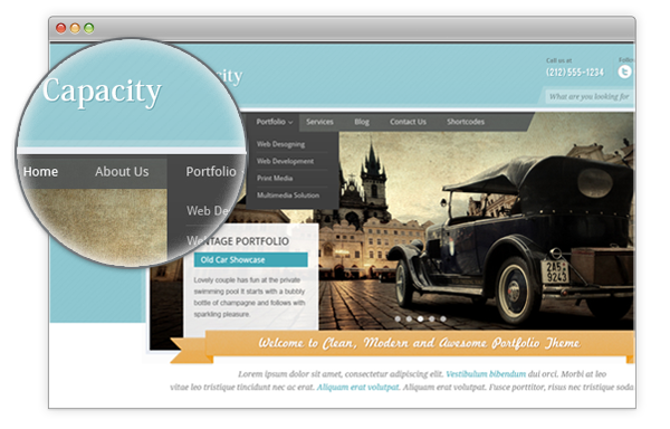 It’s got everything you’d want for a business, portfolio, or agency website. We got some really creative people in our community so we’re looking forward to seeing what you all do with this. I’ll share the feature details once we’re a bit further along. Until then, let us know what you think of this upcoming theme. 11 Responses to "Sneak Peek: Capacity Business Theme"
Looking good! Very clean design, and I like the colors. Most interesting (to me) is that “shortcodes” menu item that I see…since I manage a site with multiple bloggers (and almost none of them have any IT skills), it’ll be great to offer some theme-default formatting capabilities. Question though…do you know if there are any plans to easily include shortcode functionality on the “newer” themes running the latest framework, or would each theme have to wait until an updated new release? Just curious…. Agree with ericm. Shorcode will be Great! Especially shorcode on 1/3 and 2/3 Column Layout and Content box. Another important thing is to have a white theme (white background), so can easily handle photos. We actually have implemented shortcodes into framework and that is added into all our themes. The only reason why shortcodes are not yet enabled is because we didn’t create CSS for shortcodes yet. As soon as we get CSS file compiled, it will be matter of 1-2 line change in your current themes to enable shortcode functionality. One of the great features of City Desk theme is the Smart Navigation (two-dimensional panel divided into sub-navigation items and the most recent entries within that topic). According the image from the next new theme, the navigation menus is the “usual” (if I may say so) but without any negative meaning. It’s not possible to implement again the smart navigation menus on Capacity theme and the following themes? About this post (Sneak Peek: Capacity Business Theme), I thought it was something with my firefox browser version. Indeed, I only see this post — at the moment I write — on the right side (recent posts) but if only I click in one of the previous posts. When I close all the browser windows and tabs, also the cookies and history are gone. It is going to be Freddy, pretty soon.